A scout from the tribe has found a derelict mech, remarkably intact and still upright after a sudden failure. 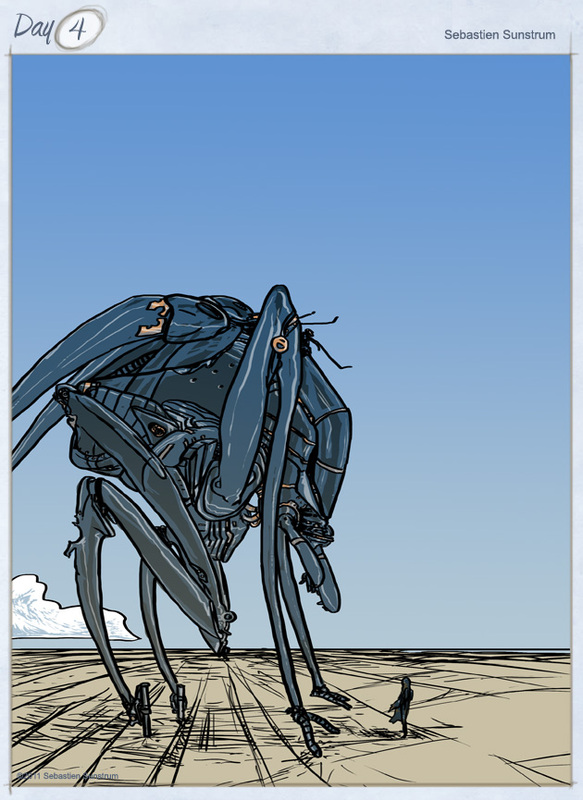 In the great salt flats, rampant mechs wander, hunt, and stalk each other and the post-humans, in search of materials. The mechs use a system of ancillary drone units who work repairs on a main body frame. These repair drones use sophisticated 3D printing technology to manufacture specialized parts, which are installed, sometimes without even affecting performance. This particular unit was unable to find materials to repair itself with, and eventually wore crucial components out, slowly becoming crippled, finally just stopping in it’s tracks, unable to move. The once-great machine was thus but a cache of minerals for whomever -or whatever to find. All right, no more of this story, I’ll just switch over to some other sub-genre, and come back later. You have a fantastic style – I hope these all lead to something sequential, I get a real sense of world building from these. Great atmosphere to this pic. I love the insect- like nature of your mechs.